Celebrate a special birthday with this classic cookie creation. Inside this collectible tin are 16 OREO® cookies hand-dipped in Belgian white, dark or milk chocolate and decorated with charming birthday-themed confections. Send a personalized birthday message too, – just from you. It’s a sweet way to celebrate their big day. 16 Cookies. Arrives as pictured. Celebrate a special birthday with this classic cookie creation. 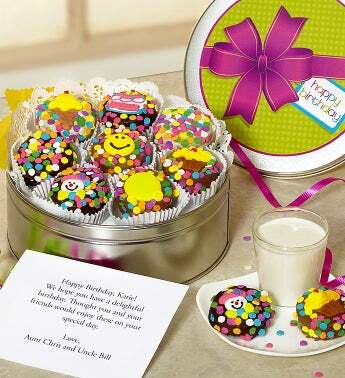 Inside this collectible tin are 16 OREO® cookies hand-dipped in Belgian white, dark or milk chocolate and decorated with charming birthday-themed confections. Please note that the personalized message comes from the card message you enter towards the end of the checkout.